In Ancient Egypt, Bast (also spelled Bastet, Baset, Ubasti, and Pasht) was an ancient feline goddess who was worshiped since the early dynastic period (ca. 3000-2700 B.C.E.). Mythologically speaking, she was understood as the protector of the Lower Kingdom, and represented the benign heat of the sun. As a result, she also came to be seen as the daughter/consort of Ra (the Sun God worshiped in that region). During the Hellenistic period, she came to be associated with the Greek goddess, Artemis. In classical Egyptian religion, Bast was the subject of considerable institutional and popular veneration. Institutionally, she was the central figure of a nationally recognized temple cult at Per Bast (Greek: "Bubastis") and was also featured in some confessional verses of the Egyptian Book of the Dead. On the popular level, she was revered for her relationship to female fertility and childbirth, such that amulets depicting the goddess (which were thought to grant biological fruitfulness) are relatively common archaeological finds in Egyptian excavations. As an Egyptian deity, Bast belonged to a complex religious, mythological and cosmological belief system developed in the Nile river basin from earliest prehistory to 525 B.C.E. Indeed, it was during this relatively late period in Egyptian cultural development, a time when they first felt their beliefs threatened by foreigners, that many of their myths, legends and religious beliefs were first recorded. The cults within this framework, whose beliefs comprise the myths we have before us, were generally fairly localized phenomena, with different deities having the place of honor in different communities. Despite this apparently unlimited diversity, however, the gods (unlike those in many other pantheons) were relatively ill-defined. As Frankfort notes, “the Egyptian gods are imperfect as individuals. If we compare two of them … we find, not two personages, but two sets of functions and emblems. … The hymns and prayers addressed to these gods differ only in the epithets and attributes used. There is no hint that the hymns were addressed to individuals differing in character.” One reason for this was the undeniable fact that the Egyptian gods were seen as utterly immanental—they represented (and were continuous with) particular, discrete elements of the natural world. Thus, those who did develop characters and mythologies were generally quite portable, as they could retain their discrete forms without interfering with the various cults already in practice elsewhere. Also, this flexibility was what permitted the development of multipartite cults (i.e. the cult of Amun-Re, which unified the domains of Amun and Re), as the spheres of influence of these various deities were often complimentary. 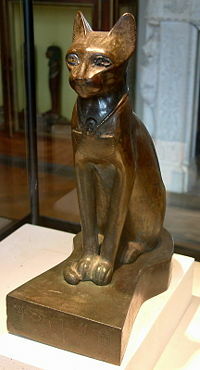 In the Egyptian context, Bast was a regional goddess who rose to prominence in the New Kingdom period (1570–1070 B.C.E. ), when her cult came to be celebrated throughout the newly-unified country. These beliefs proved so enduring that they came to be described at length by Herodotus in his fifth century B.C.E. travelogue (as discussed below). Later scribes sometimes recorded her name as "Bastet," a variation on Bast adding an additional feminine suffix to the one already present. Since Bastet would literally mean "(female) of the ointment jar," Bast gradually became thought of as the goddess of perfumes, earning the title "perfumed protector." This gentler characterization, together with Lower Egypt's loss in the wars between Upper and Lower Egypt, led to a decrease in her perceived ferocity. Thus, by the Middle Kingdom period (2030–1640 B.C.E.) she was generally regarded as a domestic cat rather than a lionness. Occasionally, however, she was depicted holding a lionness mask, which hinted at suppressed ferocity. Because domestic cats tend to be reproductively fecund and protective of their offspring, Bast also came to be associated with regarded as goddess of female fertility and of motherhood. In some popular iconography, she came to be sometimes depicted with numerous kittens. As a cat/lion goddess (and divine protector of the Nile Delta), Bast came to be identified (at least in the Lower Kingdom) as the mother of Maahes, a fierce lion god incorporated into the pantheon during the New Kingdom period (1570–1070 B.C.E.). This paralleled the notion that Sekhmet (another lioness goddess) was the new god's mother, a mythological account popular in the Upper Kingdom. As divine mother (and more especially as protectress) of Lower Egypt, Bast was eventually identified as the more substantial goddess Mut, whose cult had risen to power with that of Amun, and eventually being absorbed into her as Mut-Wadjet-Bast. 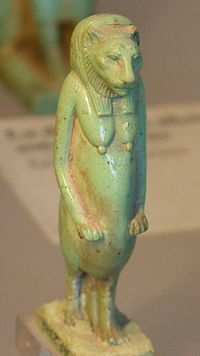 After this syncresis, Bast came to be seen as a lunar goddess (though this is more stereotypically an attribute of Mut). This lunar character (coupled with her ritual function as a promoter of female fertility) led the Greeks to describe her (in the guise of Ailuros (Greek for cat)) as the Egyptian analogue of their own Artemis. Building upon this assumption, Bast came to be seen as the sister of Horus, who they identified as Apollo (Artemis' brother), and consequently the daughter of Isis and Osiris. However, this synthesized cosmology rarely displaced the goddess's more common association with Ra. In addition to her multifarious roles in Egyptian mythology, the feline deity was an ancient goddess, worshiped as early as 3000 B.C.E. The center of her cult was in Per-Bast (Bubastis in Greek), which was named after her. From textual sources, eyewitness accounts, and archaeological evidence, it is possible to piece together an understanding of the discrete (but related) elements of this cult. First, Bast is mentioned in both the Pyramid Texts and the Egyptian Book of the Dead, where she is generally included among the gods propitiated in the funerary litanies. In the Pyramid Texts, the heart of the deceased is described as being "like that of Bastet [Bast], when he [the deceased monarch] ascends and lifts himself to the sky." This reference is evidently derived from the goddess's mythic association with Ra. This association with the Sun God is further demonstrated in an additional passage, where the deceased pharaoh appeals to the cat goddess as his mother. In the Egyptian Book of the Dead, the goddess is mentioned in the "Negative Confession," a portion of the posthumous judgment of the soul of the deceased. Specifically, the soul avers: "Hail, Bast, who comest forth from the secret place, I have not dealt deceitfully" and "Hail, thou who dost stride backwards, who comest forth from the city of Bast, I have not set my lips in motion [against any man]." As can be seen, the goddess is here associated with plain-dealing and honesty, perhaps due to the symbiotic relationship between humans and felines in Egyptian society. As suggested above, the cult of Bast was further ensconced in Egyptian society by their culturally-mandated veneration of felines. This reverence was likely prompted by two beneficial roles that cats played in their society: first, they were able to fight and kill snakes (especially cobras); and, second, they functioned as exterminators of vermin (a must for Egyptian survival, as the desert people relied entirely upon food storage to weather the months of drought between floodings of the Nile). These adored animals were sometimes adorned with golden jewelry, and allowed to eat from the same plates as their owners. These practices were prevalent enough that they were observed by visitors to the sun-drenched land; for example, Herodotus notes that "If a cat dies in a private house by a natural death, all the inmates of the house shave their eyebrows… The cats on their decease are taken to the city of Bubastis, where they are embalmed, after which they are buried in certain sacred repositories." As the primary goddess of domesticated felines, many of these honors were also affiliated with (and directed at) Bast. Thus, it was in the temple at Per-Bast that dead (and mummified) cats were brought for burial. Additionally, pilgrims to the cult city would often purchase one of these feline mummies in order to offer it to the goddess. This led to a bustling commerce in animal mummification, with breeding farms set up in the temple grounds to provide the necessary source materials. As a result of both of these practices, over 300,000 mummified cats were discovered when the temple of Bast at Per-Bast was excavated. The Egyptians do not hold a single solemn assembly, but several in the course of the year. Of these the chief, which is better attended than any other, is held at the city of Bubastis in honour of Diana [Bast]. … The following are the proceedings on occasion of the assembly at Bubastis:- Men and women come sailing all together, vast numbers in each boat, many of the women with castanets, which they strike, while some of the men pipe during the whole time of the voyage; the remainder of the voyagers, male and female, sing the while, and make a clapping with their hands. When they arrive opposite any of the towns upon the banks of the stream, they approach the shore, and, while some of the women continue to play and sing, others call aloud to the females of the place and load them with abuse, while a certain number dance, and some standing up uncover themselves. After proceeding in this way all along the river-course, they reach Bubastis, where they celebrate the feast with abundant sacrifices. More grape-wine is consumed at this festival than in all the rest of the year besides. The number of those who attend, counting only the men and women and omitting the children, amounts, according to the native reports, to seven hundred thousand. Finally, Bast was also a common figure in popular worship. During the celebration of the New Year festival, women would be presented with images of the goddess, as these amulets were understood to promote fertility and to forestall the powers of chaos (in an echo of the goddess's more savage historical characterization). ↑ Jan Assmann. In search for God in ancient Egypt, Translated by David Lorton. (Ithaca: Cornell University Press, 2001), 73-80; Zivie-Coche, 65-67; Breasted argues that one source of this cyclical timeline was the dependable yearly fluctuations of the Nile (8, 22-24). ↑ Richard H. Wilkinson. The Complete Gods and Goddesses of Ancient Egypt. (London: Thames and Hudson, 2003), 177-178; Scott, 4. ↑ Pinch, 115; Wilkinson, 178. ↑ A.E. Wallis Budge, "The gods of the Egyptians; or, Studies in Egyptian mythology," A Study in Two Volumes." (New York: Dover Publications, 1969), 447. ↑ Nora E. Scott, "The Cat of Bastet." The Metropolitan Museum of Art Bulletin (New Series) 17 (1) (Summer, 1958): 3; Pinch, 115; Wilkinson, 178. ↑ One negative side-effect of this Greek syncretism is that it becomes difficult to tell which gods Hellenized Egyptians (or Greek immigrants) were referring to (i.e., were they discussing Artemis or Bast?). Françoise Dunand and Christiane Zivie-Coche. Gods and men in Egypt: 3000 B.C.E. to 395 C.E., Translated from the French by David Lorton. (Ithaca, NY: Cornell University Press, 2004, 242. ↑ Remnants of inscribed pottery bearing the goddess's name have been discovered by archaeologists and dated to the early part of the third millennium B.C.E. Further, ancient temple complexes from the early Dynastic period bear inscriptions to the deity or iconographic depictions of her (Scott, 3). ↑ While this is the common consensus, Scott argues that the goddess's name (as Bastet) essentially means "she of Bast," which would imply that the town was named first (3). ↑ Samuel A. B. Mercer (translator) The Pyramid Texts. (1952), 1310c-1310d, Accessed online at [www.sacred-texts.com/egy/pyt/index.htm sacred-texts.com], 218. Retrieved April 1, 2008. ↑ A.E. Wallis Budge. (translator) Egyptian Book of the Dead, (13, 18), (1895), 348. Accessed at sacred-texts.com.Retrieved April 1, 2008. ↑ Herodotus, History (Book II: Euterpe), translated by George Rawlinson. Accessed online at: the Internet Classics Archive. Retrieved July 21, 2007. ↑ Concerning the trustworthiness of the Greek historian, Zivie-Coche notes that "though [he] liked to wallow in picturesque observations, many of his details have been verified by actual Egyptian texts" (119). Assmann, Jan. In search for God in ancient Egypt, Translated by David Lorton. Ithica: Cornell University Press, 2001. ISBN 0801487293. Budge, E. A. Wallis. Egyptian Religion Kessinger, 1900. Budge, E. A. Wallis. The gods of the Egyptians; or, Studies in Egyptian mythology, A Study in Two Volumes. New York: Dover Publications, 1969. Langton, N. and B. The cat in ancient Egypt. London: Kegan Paul, 2000. ISBN 0710307101. Meeks, Dimitri and Meeks-Favard, Christine. Daily life of the Egyptian gods, Translated from the French by G.M. Goshgarian. Ithaca, NY : Cornell University Press, 1996. ISBN 0801431158. Scott, Nora E. "The Cat of Bastet." The Metropolitan Museum of Art Bulletin (New Series). Vol. 17, No. 1 (Summer, 1958). 1-7. The Domain of Bast Per-Bast.org. This page was last modified on 14 May 2016, at 19:06.